In their efforts to retain employees, companies spend billions on recognition programs—by one estimate, $27 billion on noncash incentives in a single year—and yet last year 65 percent of employees reported they felt unrecognized. How is it that we are spending so much and achieving so little? Cindy Ventrice says it’s because few organizations understand what makes an employee feel truly recognized. Awards, perks, and privileges don’t really motivate—nobody knocks themselves out for a plaque or a parking place. Effective recognition is integrated into the daily routine of the workplace, and the key elements are intangibles: praise, thanks, opportunity for growth, and respect. This is why recognition is a task for managers, not human resources. Only managers are in a position to offer these kinds of rewards, and Ventrice explains what managers must do to make them specific, relevant, and truly personal—all vital aspects of effective recognition. She discusses the importance of peer recognition and even self-recognition, but in survey after survey, employees report that the recognition they most value comes from their managers and supervisors. In this revised second edition, Ventrice offers new examples of successful recognition programs from around the world and addresses providing effective recognition in an increasingly virtual work environment. And there are two completely new chapters: on understanding cultural differences in reward preferences—generational, international, and others factors—and on ensuring that reward practices are perceived as fair and equitable. Make Their Day! 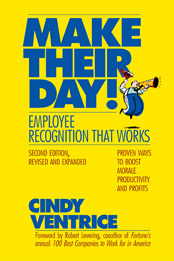 reveals what employers and employees should expect from recognition and what managers can do to give morale and productivity a genuine, lasting boost.